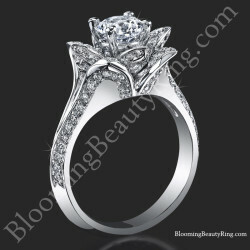 From ancient times the Lotus has been a spiritual and divine symbol of virtue, grace and mystery. The unfolding of a lotus petal, to many, suggests the opening of the soul to new beginnings, and new ideas. 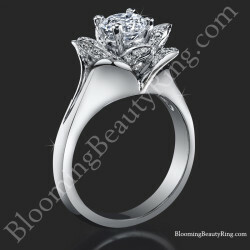 This is the reason why we chose to make the lotus engagement rings collection. 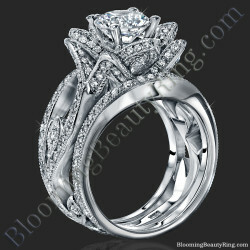 After all, what’s marriage, but a new beginning, and an openness to new ideas. 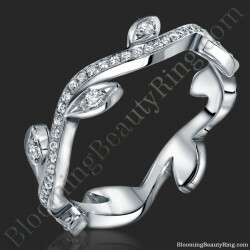 We also modeled our lotus rings to the very nature of the lotus flower. Meaning we did our best to show why it’s considered so sacred to so many. 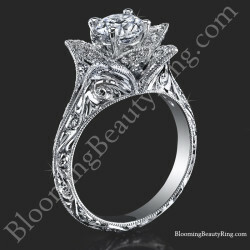 Our lotus flower rings mimic the very nature of the lotus allowing each diamond to show it's true brilliance. Each Lotus Engagement Ring, like the actual lotus flower itself, has petals that sit higher, and expand out as if in a backward dive. Opening up to receive as much sun as possible. 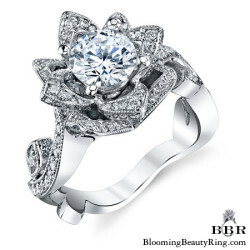 In the case of our lotus flower rings, the rings are mimicking this very act of nature so that it, too, can absorb as much light in and through the ring to make each diamond, small or large, show it’s true brilliance and sparkle. 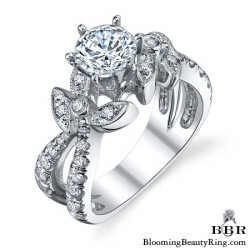 The lotus flower and our lotus rings have two other major unique qualities that compare to each other. Each one, even if in the same class, can have very different details embodying it. 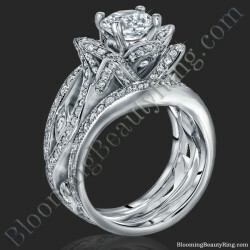 Comparable to a fingerprint, each lotus, like each of our lotus flower rings are unique. 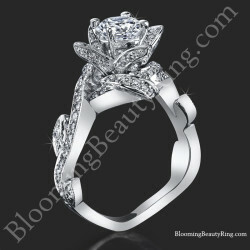 Even better, being designers, we can make any alterations to any of the styles, or make a completely new one just for you. 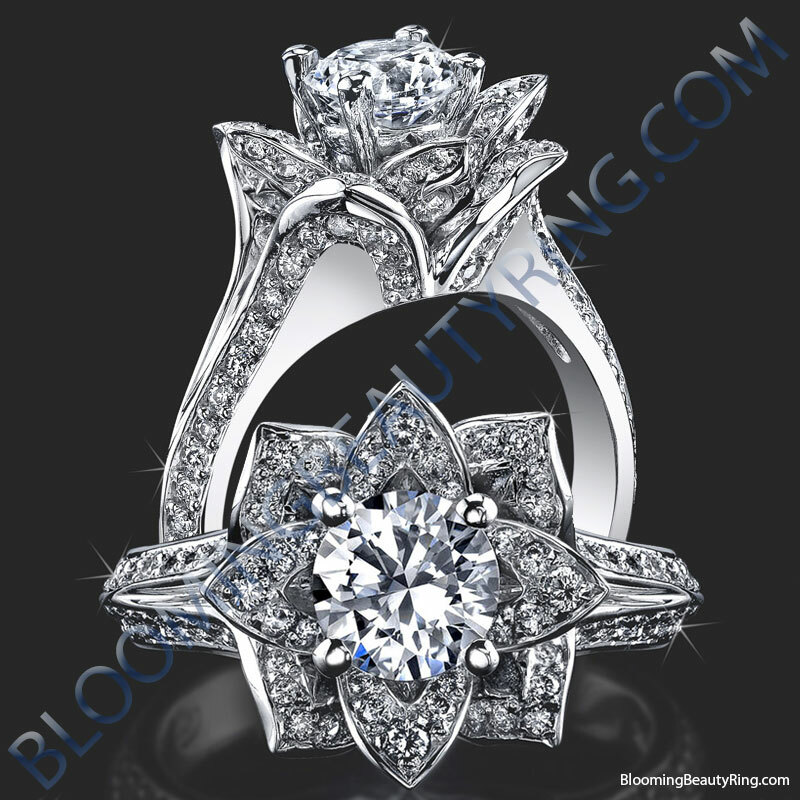 If you’re wondering what the other quality is, it’s the same quality that’s given the lotus it’s unique mystique and meanings over the years. It’s the flower’s ability to rise it’s “head” above anything. No matter where it’s planted, or where the winds carry the seeds. Whether it be water, dirt or swamps of mud, the lotus flower manages to always bloom above it all without so much as a speck of mud on it. While it’s stem has somehow found a way to keep a steady foot (root) underneath without ever showing itself. To anyone who looks at one, no matter where it is, they can somehow find meaning in it, and relate it to their life. 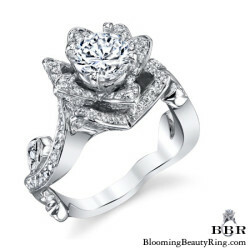 We hope anyone that purchases a lotus flower engagement ring from us, whether it’s one of our designs or one of yours, will remember what the lotus flower really represents, and have fun with it.